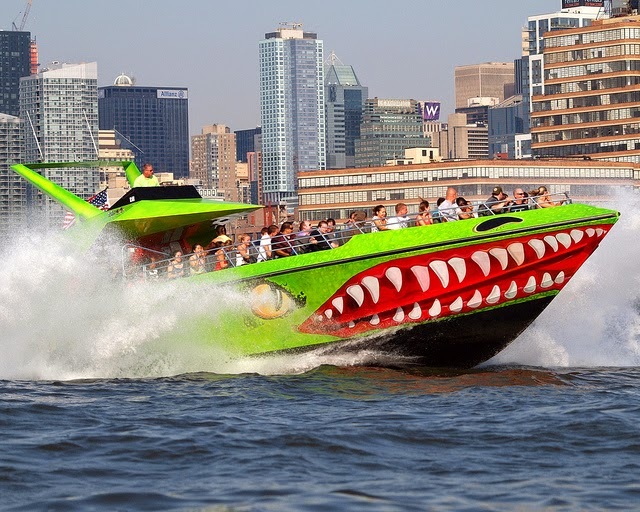 The Beast is New York’s only jet-powered speedboat! It is operated by Circle Line Sightseeing on 42nd St and departs from pier 83. The Beast is a thrill seeking, adrenaline pumping ride that sees you tearing down the Hudson River to the Statue of Liberty. It is a fun and exciting way to experience all New York has to offer from the water, taking in the beautiful New York City skyline from all angles, speeds with even a couple of spins and 360’s thrown into the mix. The Captain and his mate aka your your tour guide provide you with an engaging, fun, adrenaline filled and exciting way to experience New York, the Hudson River and Statue of Liberty. The 30 minute ride is packed with a mixture of loud, pumping music to help get the adrenaline flowing with your guide also taking the time to point out important places amongst the NYC skyline and interesting facts about this beautiful, exciting city! A ride on the Beast is a must do in New York, as they also provide you with a perfect opportunity to get that special, must-have photo of the Statue of Liberty with the boat stopping to allow you this photo opportunity once you reach the iconic monument. The staff were friendly, engaging and super helpful ensuring everyone had a great time and even assisted with photo taking. Enjoy, and be prepared to get wet!